What is the Junior Doctor Body? We see our work as complementary to the mess which aims to improve sociability, and the Junior Doctor Forum which is a platform for discussion of rota/contract issues. Why was the Junior Doctor Body set up? Leeds Teaching Hospitals NHS Trust employs around 950 junior doctors. There are many opportunities for junior doctors to develop themselves in leadership, management and quality improvement but these are often not widely known about. Informal discussions with senior managers at the trust revealed a genuine desire to engage doctors in the work of the trust in a way that isn’t always apparent on the shop floor. The aim was to set up a group of enthusiastic doctors who would themselves be offered opportunities that might otherwise be hard to come by, but would also be outward facing, and help encourage others to participate in such activities. In addition, it allows us as junior doctors to have a voice. Who makes up the Junior Doctor Body? The Junior Doctor Body was set up in 2016 by clinical leadership fellows and the “Chief Medical Registrar.” who found that there were many opportunities available to them that hadn’t been visible in their previous clinical roles. The ideal is to have at least one junior doctor from each clinical service unit (CSU) within the hospital regularly attending meetings and acting as a spokesperson for all junior doctors working in their CSU. The aim is that the member of the junior doctor body for each CSU should form links with their clinical director or other senior managers within the CSU. In addition, we have more junior members to fully represent the range of experience amongst junior doctors. The group is sponsored by Yvette Oade, the Chief Medical Officer, who attends meetings where possible and has close links with the leadership of the group. 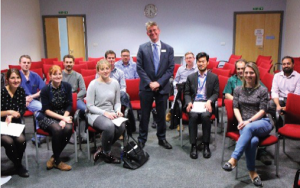 The meetings are also regularly attended by Stuart Haines, General Manager for Corporate Medical Directorate / Medical Education and senior managers across the trust are invited to attend meetings and offer their perspectives on issues relevant to junior doctors.